Small and medium sugar mills will see a marked improvement in profitability because of the hike in the minimum support price (MSP) for sugar and other government measures. The central government raised the MSP from Rs 29 per kg to Rs 31 in February 2019 and sanctioned soft loans of Rs 10,540 crore to help mills repay their cane debt. Consequently, their EBITDA margins should move to a positive trajectory of one to two per cent, from the previous forecast of negative five to seven per cent for sugar season (SS) 2019 (October 2018-September 2019). Production is expected to be lower in SS 2020, which will push up sugar prices by the end of SS 2019. This would expand margins of SMEs in sugar season 2020. A number of measures have been taken by the state and central governments to improve the liquidity position of stressed sugar mills. In October 2018, the Uttar Pradesh government had sanctioned Rs 4,000 crore to be issued as soft loans to sugar mills to help them clear their cane dues. Uttar Pradesh accounts for about 40 per cent of India’s sugar production. Of this, SME mills account for 35-40 per cent of the state’s sugar production. Prior to that, in September 2018, the central government had announced transport subsidies of Rs 1,000-3,000 per tonne for ease of transportation of sugar for export. However, this is expected to have negligible impacton SMEs, as their exposure to exports is minimal. 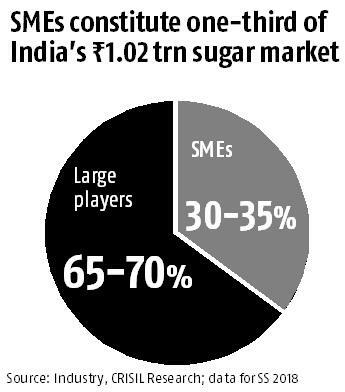 SMEs constitute one-third of the Rs 102,500 crore sugar market in India, as of Sugar Season 2018.